I wanted to share very quickly the thank you notes I enclosed with my jewelry party thank you notes. The new hostess set in the Occasions Catalog, Making a Point, has a bunch of cute images. Although this would be better suited to a makeup party, I think my attendees get "the point" (No pun intended! LOL!)! I embossed the nail polish bottle with gold Encore ink and gold embossing powder, then colored in the image with my aquapainter and the Melon Mambo/Basic Gray ink. The final element? A cute envelope insert in matching Melon Mambo paper from the Brights paper stack. Using the smallest envelope liner, the insert was a piece of cake! 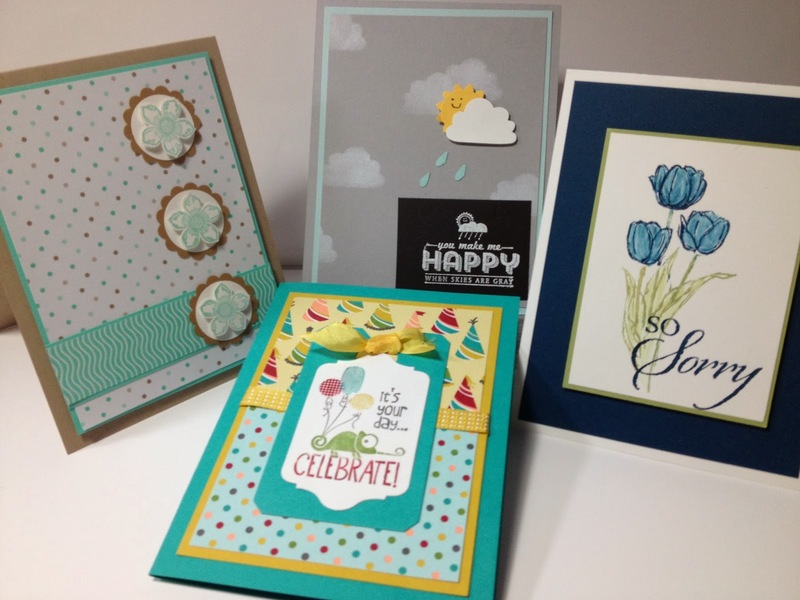 Come back soon for more fun stamping projects! I've been busy, but I'm on my way out the door for my overnight job -- gotta run!! A Little Extra Stampin' Time! Hi friends! I finally have a few days off in a row to do some fun stamping! Yesterday, I had my weekly class with my wonderful ladies -- boy, do I ever enjoy stamping and sharing with them. I'm going to share my class project photo with you, but first I need to tell you that every card I made was cased! Yep, some much more than others! I'll try to include the source, but let me start out by telling you that I LOVE Pinterest!! There are so many great ideas! The card on the right was created by Linda Schnabel at lindasstampinescape.com I simplified it and changed up the colors, but that's it! If you don't recognize it, it's the So Sorry stamp set for sentiment, and the Blessed Easter stamp from the Stampin' Up! Occasions Catalog. I'm not a huge fan of the sentiment on the Blessed Easter stamp set -- the sentiment appears crooked to me, so although I love the message, I removed it when mounting the stamp set. The bottom card was created by my friend and colleague, Margaret Galvez. I again simplified it, but the concept is totally hers. We used the Tag It stamp set to stamp this card -- the tag is colored by using markers directly onto the stamp. Don't you just love the card in the back?! It's created by Amanda Burditt -- I don't think I changed a thing! Link to her name to see her card and how she created it -- very clever!! I was stumped as to the "raindrops"!! 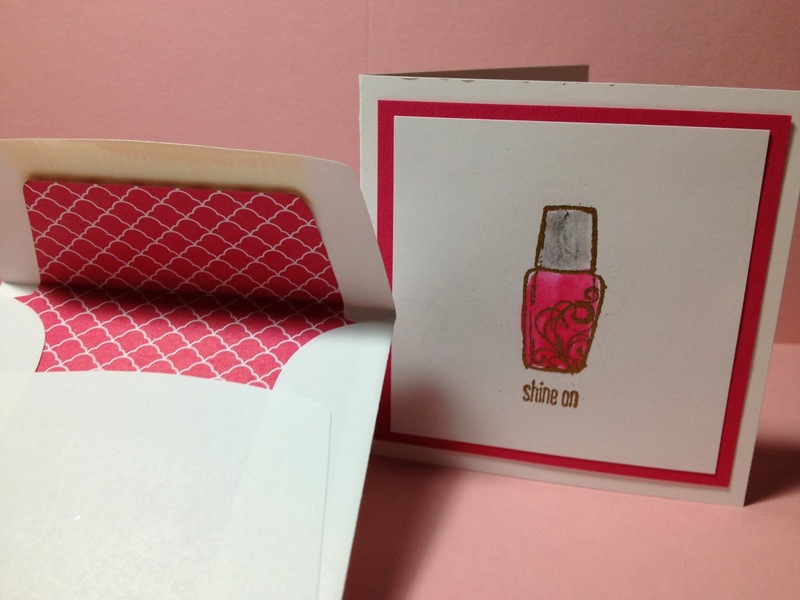 The last card, the card on the left, also came from Pinterest -- Angela McKay from North Shore Stamper created two different cards, both with the Petite Petals stamp set and punch and the Fresh Print paper stack. I chose one of her cards to copy exactly! There are so many different patterns in the stack that you should really head right over to my store to purchase a pack of your own! The stamp set, of course, is the See You Later stamp set that's currently in the Sale-a-bration catalog, free with a $50 purchase. Tomorrow, I'm going to share some Thank You cards that I made for the ladies that came to a Premiere Jewelry Party that I hosted a few weeks back -- stay tuned!! Once again it's been a number of months and I'm going to jump in to update my blog again! I never stop creating, but sometimes get put off my the time it takes to load some information here, mainly because I'm a perfectionist and want to make sure you can easily find the resources to create yourself! Well, here's next week's card class, Winter Thank You. Supplies (besides the obvious): Label Thinlit with Label Framelit from that set (to make the back flip card), Basic Jewels Rhinestones, Midnight Muse Satin Stitched Ribbon, Dazzling Diamonds Glitter. 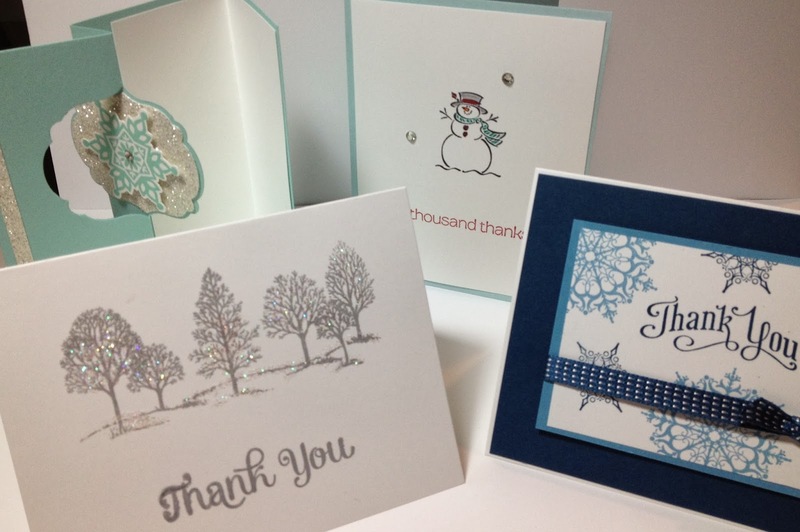 Card Stock Colors: Whisper White, Midnight Muse and Marina Mist, Pool Party with Silver Glimmer, Soft Sky (for snowman card).